Check out some of the articles that have featured my bikes. If you're a bike journalist and want to set up an interview or highlight my work, give me a shout! Thanks for the love, Silodrome! "The passions are born of young people, when they are children and so it believed that every dream can be put together and even Andrew, like many, has been fascinated by motorcycles, with a particular fascination for Ducati..."
Thanks for the love, Rocket Garage! Bikebound: Please tell us a bit about yourself, your history with motorcycles, and your workshop. Me: I am Andrew Jett and over the past few years have been building track cars for the ¼ mile. This passion for cars and speed generated my passion for designing motorcycles. I studied fine arts/design in college. Designing motorcycles has allowed me to merge my creativity with a desire for functionality, and turn it into something real. Bikebound: What was the design concept and what influenced the build? Me: The design concept of this particular build embodies the spirit of the GP and enduro racers of the 1970s, of which I am very passionate. I have always loved the curvaceous front fairings of these vintage race bikes. 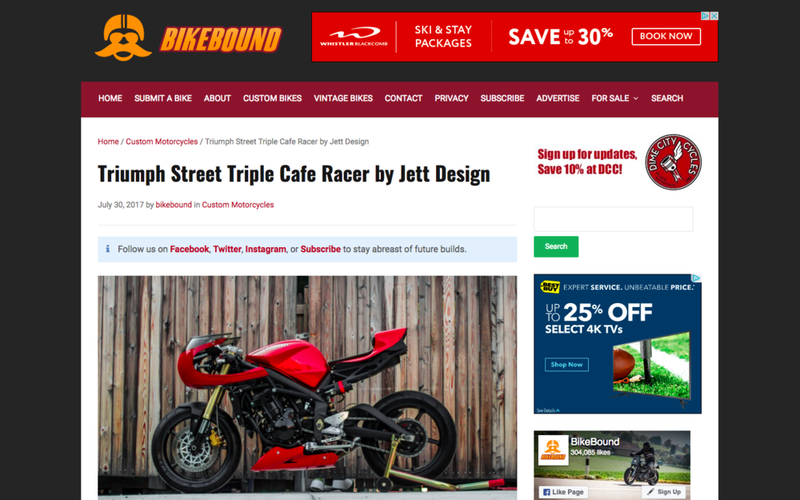 Thanks for the opportunity, BikeBound! "Functionality and flair come together in the form a landbound rocketship. 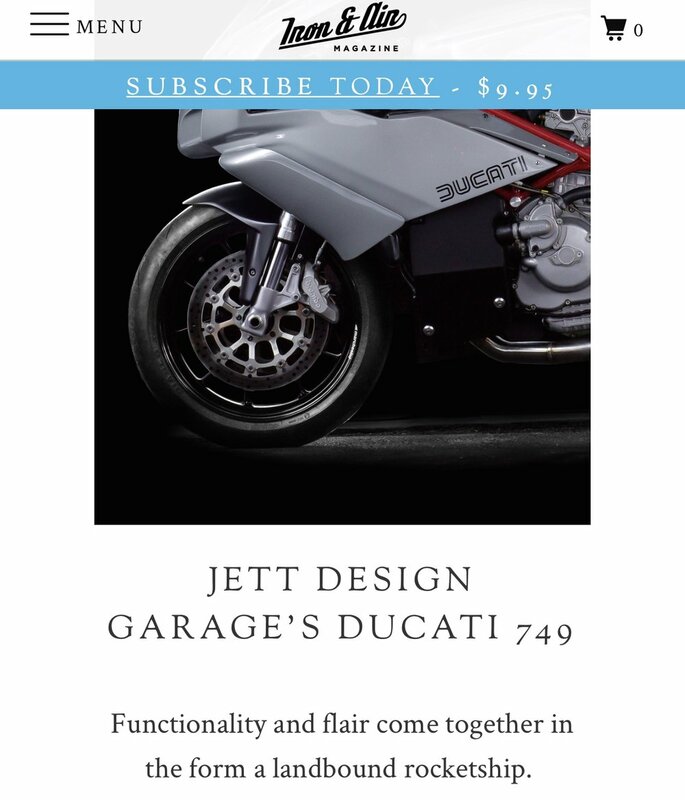 About nine months ago, Jett snared the moto community’s attention after pulling the sheet off his gorgeous Triumph Street Triple 675 café racer, capped with a cool, chopped bikini fairing. The “cut windscreen” is slowly becoming Jett’s signature style, seeing how he’s done it again on this lovely Ducati 749..."
Thanks for the love, Iron & Air! "Andrew Jett of Jett Designs wanted to pay tribute to the beautiful styling of the 70’s and 80’s era race bikes but on a modern platform. Well this beautiful Triumph Street Triple Racer is just that. Perfectly styled based on the early racers but with all the modern technology and performance of today’s bikes..."
Thanks for the love, The Moto Blogs!